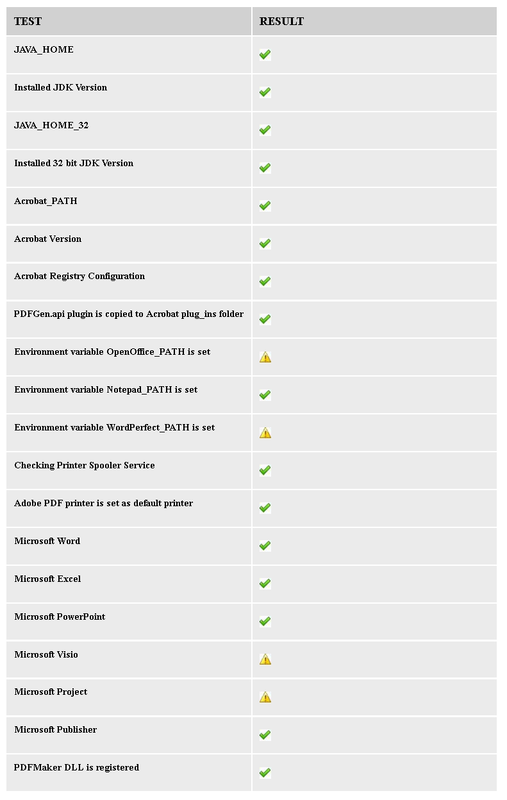 Let's face it - configuring AEM FORMS (formerly Adobe LiveCycle) PDF Generator is complicated. It is mainly because of the nature of what it does - programmatically invoke [Microsoft Office] applications such as Word/Excel/PowerPoint to convert their native documents (.docx, .xlsx and .pptx) to the PDF format by programmatically invoking [Adobe Acrobat]. NativeToPDF conversion is single-threaded. Higher clock speed CPUs will perform better. Windows Server 2016 requires about 3 GB of main memory. AEM's JVM requires at least 6 GB of heap to perform well. Native2PDF conversions requires additional memory since they invoke [Microsoft Office] Applications such as WINWORD.EXE (64 MB per process) as well as Adobe Acrobat. A boot volume of at least 30 GB and a data volume of at least 50 GB will suffice. If possible, use disk types that offer latency of 10 ms or less. Because Microsoft Office's native OS is Windows, and since Adobe never released an Acrobat version for Linux, the most functional OS for PDF Generator is Windows. The latest Windows version supported in AEM FORMS 6.4 is [Windows Server 2016]. It can be 64-bit. Because of the additional cloud-related complications (mostly licensing-related) of Office 365, it's better to stick with the traditional earth-bound Office 2016 Professional. It works. Acrobat Professional 2017 is also supported. Because Adobe has so far not ported the 32-bit C++ components of AEM FORMS (see in \crx-quickstart\bedrock\svcnative\) to 64-bit yet, and since those are invoked from AEM (a Java application), you need 32-bit [Microsoft Office], a 32-bit JDK (mapped to the environment variable JAVA_HOME_32), and 32-bit [Adobe Acrobat]. NativeToPDF conversion is single-threaded. However, if your server instance has four CPU cores, you can configure PDF Generator to concurrently service four nativeToPDF conversion requests by creating/configuring additional Windows users. Ensure that these additional users are registered at /libs/fd/pdfg/config/ui.html (see the tab 'User Accounts'). Ensure that you are logged in to AEM before you load this page - it'll throw an exception otherwise. These users need to be members of the Windows group 'Administrators'. When registering additional Windows users for multi-threaded performance using the config UI at /libs/fd/pdfg/config/ui.html, remember to clear the password field each time. For some weird reason, it gets populated with garbage on every initialization. Also note this registration will fail without a proper error message if the user being added is not already a member of the Windows group 'Administrators'. Since Microsoft Office is a desktop application, each configured user needs to launch these applications at least once, register the license key, and accept the license agreement. [Adobe Acrobat] puts up some dialogs when you login for the first time which need to be dismissed. Make sure that the folder \Desktop exists at C:\Windows\SysWOW64\config\systemprofile. If not found, create the \Desktop folder. Creates a set of Windows Registry keys under HKEY_LOCAL_MACHINE\SOFTWARE\WOW6432Node\Adobe\. Note that when you configure AEM to start/stop automatically as a Windows service, those settings are saved in the Registry at HKEY_LOCAL_MACHINE\SOFTWARE\WOW6432Node\Apache Software Foundation\Procrun 2.0. See this for more details. Copies the PDFGen.api plugin to the Acrobat plugins folder at (by default) C:\Program Files (x86)\Adobe\Acrobat DC\Acrobat\plug_ins\. This sometimes fails, forcing you to do this manually. Adobe provides a batch file to run (Acrobat_for_PDFG_Configuration.bat) and another script (SystemReadinessTool.vbs) to verify the configuration. But these are packaged inside the [AEM FORMS Add-On] package, 3 levels deep! Adobe provides a script (SystemReadinessTool.vbs) to verify the configuration that produces a nicely-formatted HTML report (see this). It is located in the adobe-aemfd-pdfg-utilities-4.1.6-win.zip package. The folder \crx-quickstart\temp\ experiences high disk I/O (temporary file creation/deletion) during NativeToPDF conversion jobs. For performance reasons, you should think about hosting the \crx-quickstart folder on a more performant disk. See index for all entries in this blog.